In recent times there have being a number of Copy Cats in his space , not as widely distributed but they are definitely looking to make a dent in his profits, after all they are selling to the exact same customer segment , early morning commuters . I give it 6 months to 1 year till it becomes a real problem for his profits …. As you can imagine I think strategy and tech in all I do. So if I was Mr Koko King how would I strategically differentiate myself to ensure that I don’t become the Ghana Blackberry? Get to know you Customer:Star bucks style, collect information on their preferences and use that to personalize the experience. Having the sales person know that I like wheat lukewarm with Boflot 3 times a week, means I won’t have to ask. 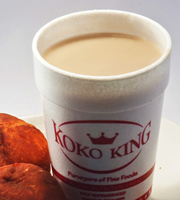 Turn the website into a sales tool not just marketing tool let people order and pay for Koko king on your website ,let them give you feedback , let them talk about their favorite porridge , create a cult community !!! Use Google Map and GPRS to enable users find the closest vendor via the mobile , they should have a phone number to call the sales person to make their order. Is there a company that complements you efforts that you could create joint breakfast products around?